1.Place a digit 1-9 in every white cells of the grid so that no digit is repeated in any sequence of vertically or horizontally connected white cells. 2.A number to the left and above each such sequence is a result of the following operation: Multiply first two digits (from left to right or top to bottom) in the sequence, then add the rest (If there are any). Background: This is one of 21th WPC puzzle. I saw two puzzles of this type in the 21th WPC. One of them was in Part 2, Assorted, Blackjack. The other one appeared in WPC Finals. If I remember correctly both puzzles had 21 theme. In part 2, I spent so much time for solving that one. 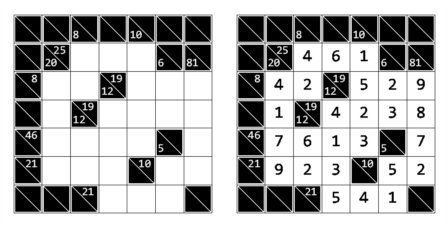 I could solve top half of the puzzle, but I cannot say samething for the bottom half of the grid. Bu yazı Instructions içinde yayınlandı ve kakuro, puzzle, WPC olarak etiketlendi. Kalıcı bağlantıyı yer imlerinize ekleyin. Part 2 was Blackjack and Part 8 was Assorted I guess.